It may seem a bit strange that a freelancer, who is running a business, is preparing a resume to present him or herself to a client, much like someone who is applying for a job would do. While freelance writers and other professionals do bill by the word, hour, or project, and don’t get paid a salary like an employee, clients do need to have a way to evaluate whether someone would be a good fit for a particular project. If your goal is to stand out from other freelance writers who are applying for the same gig, you need to spend some time thinking about yourself and the skills and abilities that you bring to the table. You will have included this information on your resume, so that a prospective client can find out something about you and the kind of work you have done in the past. To provide the reader with more information about you, include achievements in your resume. What achievements, you may be asking yourself. Think back through the jobs you have had and try to find some way that your employer’s business was better off for having hired you. When it comes to your freelance writing career, the information is a bit different. If your content has helped a client get a Top 10 ranking on Google, this is something you should be sharing. The fact that your copy has helped a client increase sales by X percent is also worth listing on your resume. If you have ever won, been selected as a finalist for or judged a writing contest, include this fact in your resume. Any writing, spelling or grammar-related awards can also be listed. It’s one thing to tell a prospective client that you’re good at what you do. Listing your achievements will show him or her and make you stand out from the pack when you are applying for freelance writing jobs. Do you list your achievements on your freelance writing resume? Do you feel that this is an effective strategy for making a prospective client want to contact you? I like to check out the search terms that bring readers to this blog, and I’ve noticed that the question of how to show your freelance writing jobs on a resume comes up often. Showing your freelance work on a resume can be a bit challenging, especially if you are doing ghost writing and don’t want to reveal your clients’ names. Some clients would prefer not to reveal that they hire freelancers to work for them and so you need to find a way to tell a prospective client about your freelance writing experience without revealing too much information. The Employment section of my freelance writer resume has a combination of jobs where I worked for companies as an employee as well as a description of the kinds of work I have done since I started working for myself. Listing past employers is pretty straightforward; I include the company name and location, as well as the job title. Then I list what my responsibilities were when I held that position. When I list my freelance writing jobs, it’s a bit different. Instead of listing an employer’s name, I use “Freelance Writer (Self-employed)” instead. I indicate the year that I started freelancing and the fact that this is my present employment situation. In the description, I list the types of work that I have done (SEO articles, copy writing, ebooks, etc. ), as well as the types of topics that I have written about. Many of these types of projects are ghostwriting gigs, and I don’t share the clients’ names on my resume. I have other gigs where I get a byline, and I do list client names on my resume for those ones. 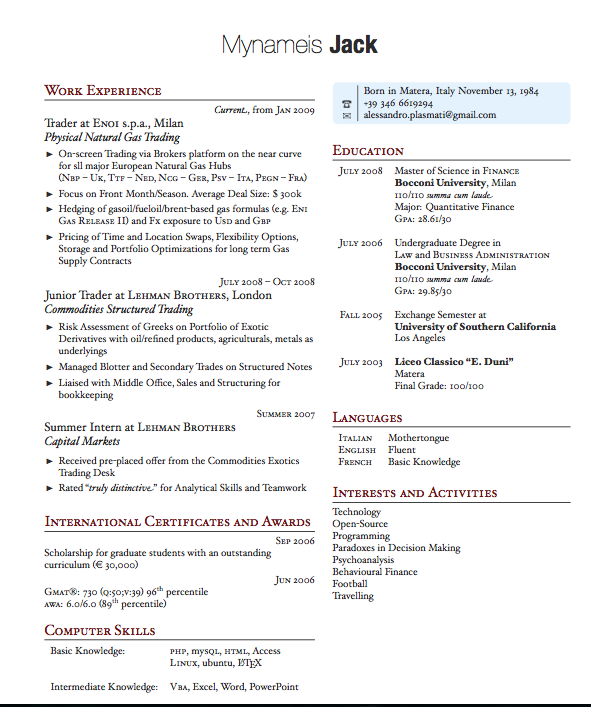 How do you set up the employment section of your freelance writer resume?